Ok so the present situation is not that difficult for the beginner, see Log_file/Easy (wiki), but I still feel it can be improved. Makes sense to to me that the ability to send the log is found in the same window where you enable the Debug Logging. Is there anyway we can do something similar? 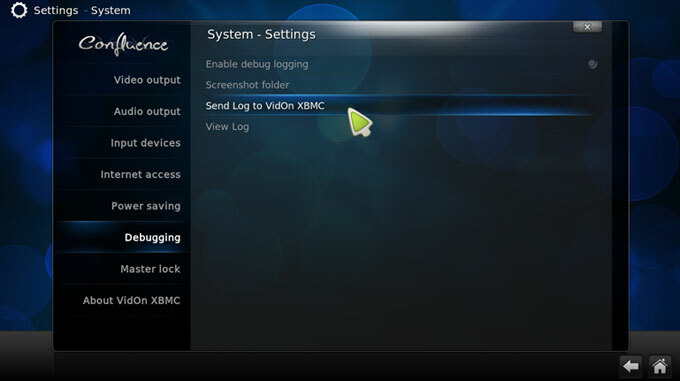 For example the "XBMC Log Uploader" addon does a great job, could that be launched from a "Send Log" button in "Debugging"? of course that would mean including it as a default addon so it's always available. The downside is the Team would have to maintain the addon, however as the author prae5 is already on the Team I don't see this as an issue for now, although I guess it might be if he didn't have the time to continue maintaining it himself. Anyway just an idea I had to further simplify the posting of a log for the newbie, and posting here in case someone else might see some merit in it. Sphere (team member) is also maintainer of the add-on. When we talked about adopting the xbmclogs.com website there were two issues. 2. possible junk that will be posted on it with "piracy" related logs or whatever. Because of these reasons we didn't officially" adopt the website. This is just for reference to possible issues when auto installing that add-on. 1. remove the advertising and host the website ourselves. 2. not include it by default but unhide the option if installed. 3. any possible other implementation ....... ? (2014-10-24, 11:45)jjd-uk Wrote: The downside is the Team would have to maintain the addon, however as the author prae5 is already on the Team I don't see this as an issue for now, although I guess it might be if he didn't have the time to continue maintaining it himself. While prae5 maintains the server-side (xbmclogs.com), the addon itself is developed by me. I already have some TODOs in my list for this addon (e.g. the XBMC->Kodi changes). I am not 100% sure but I guess a skin could add this button to the screen. Ah, apologies sphere not followed the actually development so didn't realise you were the actual author. As I said, just an idea I thought I'd put out there to see if it might inspire someone to make things even easier for the users. I'm sure we're all fed up with continually posting the wiki link for Log_file/Easy (wiki) so anything that lessens the need of referring users there would be good by making the "XBMC Log Uploader" addon more discoverable, note I say only lessen as there'll always be users who don't even find Debugging in Settings. What could now maybe be made easier is the add-on also controlling the "enable debug"? Using JSON_RPC you could control the debug from the addon so you can simply tell users to enable it in the addon and disable it. Just a thought. Couldn't we treat the addon/website the same way we treat thetvdb and similar sites? We just make it the default addon for post logs, while allowing users to use other addons if they are developed. That way, it doesn't really matter if there's advertising or other junk, it's just the random site we decided to default to. Must have missed this thread. Thanks for bringing this back up, @zag. @Martijn, got any objection to my proposal to just treat it the same way we treat tvdb and moviedb? let's wait on the log refactor first before taking any action. Could the upload location to customisable? Maybe have both xbmclogs.com and pastebin.com as built-in options and then ability to specify a URL for any other location. (2014-11-15, 14:23)jjd-uk Wrote: Could the upload location to customisable? Maybe have both xbmclogs.com and pastebin.com as built-in options and then ability to specify a URL for any other location. In theory yes: The add-on could be changed to allow uploading to other services. But other services don't provide the "email sending back channel" paul and me built (you can enter your email address in the add-on setting, upload a log and you will receive an email with the link to you uploaded log). The add-on could use every(*) pastebin-like service, independently of the OS - pastebinit is written in python (http://bazaar.launchpad.net/~pastebinit-...pastebinit). But uploading a log is so trivial that I don't think using an external script is worthwhile. But yes, any such service gives back some kind of ID. In theory we could upload the log to any service, get back the ID/URL and use paul's service to send an email. Sorry, this is brief as I'm need to nip out for an hour or so (shout if i miss any of the questions above). A little backstory as to why the site has been unstable over the past 4 or 5 months. About 6 months ago, I added some additional filtering to the site to try and cut out some of the links to piracy content that was being posted and mentioned in some of the logs. This is to try and limit the number of takedown notices I was receiving and additionally to stop both my ad account and google analytics account getting terminated (todays top tip - don't use your main GA account on a site like this!). Every now and again I get another request from them asking to help them, I ignore these now, however coincidently around about these times, when I don't reply I see a massive spike in traffic coming to the server. I cannot confirm who is doing it, I will just let you draw your own conclusions. 1. For the moment i need to offset the cost of the site, so it needs to come from ads or donations. I'll happily remove ads if i can get enough donations to cover 12 months of costs (ads do not come close to covering the cost - i'm not making anything from this). 2. Site typically sees about 5-15gb of logs uploaded a week, they are stored in a mysql db on a 60gb ssd raid partition. That is why i nuke logs older than 3 weeks. 3. I did chat with pastebin.com a while ago to see if i could set something up with them, when I explain why I wanted to move (spam/takedowns) they weren't interested at all - disappointing, but understandable. 4. When the site is being spammed, they are uploading about 20-30gb+ of logs every couple of hours. Additionally we got the odd DDoS that completely saturated the 10Gb uplink coming to the rack. 5. Forgetting the abuse we were outgrowing the server it was hosted on anyway, I'm moving it to better server now and looking at getting some filtered IP's that will give better DDoS mitigation. 6. Longer term I need to look at moving it to a completely dedicated server with a good chunk of ram in it to keep mysql happy. On a more positive side, this has given me a push to upgrade to a few things and add some new features. These are pretty much all good to go, I just need to spend a little time with sphere to get the addon using the new api. Prae5, I've nominated you for a little help from kodi if this feature gets in. Maybe look at limiting the spam somehow from single IP addresses. Great to see this moving forward anyway. It will be a huge improvement for Kodi.